Our code update only updates the default templates – it doesn’t touch your custom templates since those are, well, custom, and we don’t want to do anything to mess with them. This means, of course, that if/when we make changes to the base (default) templates, you also need to update your custom templates with the new / modified info. 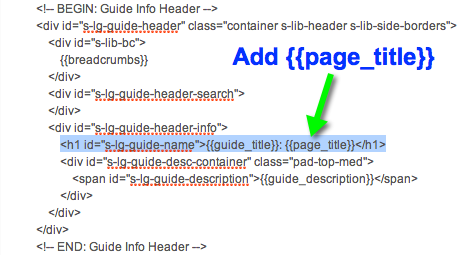 If you are using the default templates for your guides, you don’t need to lift a finger. This update has already applied to those guides! If you are using custom templates for your guides, though, you’ll want to pay attention to the next section of this post so you know how to update your templates. 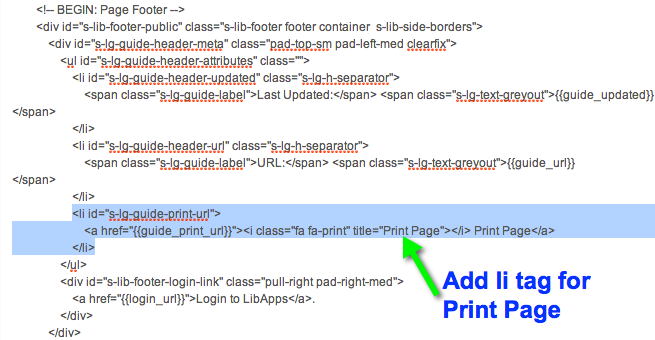 Go to Admin > Look & Feel > Guide Pages Layout > Edit a custom template. Do not delete the surrounding <div> tags (as previously mentioned, oops!) because that will remove the super-important menus from the admin side! Repeat these steps for all custom templates in your system. You also now have another Keyword Parameter option! You can choose to display the guide title on all pages of the guide, or just the homepage. When will I be able to migrate my LibGuides v1 content into my LibGuides v2 system? We’re working on the scripts and will then test them; we’ll start migrating systems after we’ve run through testing and verify the scripts are working properly. Based on our current timeline, we’re planning to start migrating systems toward the end of April. How will I request my content migration? There will be a button in your LibGuides v2 Beta system, similar to the one in your LibGuides v1 system for requesting the beta site. We are also working on a scheduling system where admins can schedule their migration to run within a 24 hour period of their choice. How long will migration take? Once we start running the scripts, it should only take a few hours. Actual run time depends on how much content is in your LibGuides v1 system. What will / will not transfer from LibGuides v1 to LibGuides v2? There are more FAQs below this table regarding details for accounts and guide content, so keep reading after you look over the table! Will the migration overwrite any of the content I’ve already added to my LibGuides v2 Beta site? What if I already created accounts in my LibGuides v2 Beta system? And what account info gets migrated? No worries! If the user’s account already exists in your Beta site, the migration will simply match up the account IDs between v1 and v2 systems so guides, etc., continue to be associated with the right account as they’re brought in. Of course, this assumes a 1:1 match! If your v2 username is different from the one in your v1 system, it will not match and a second account will be created. So, as long as you use the same email address for your username in both sites, you’ll be all set! As for what gets migrated: name, password, user level, profile information except: office hours, badges, custom boxes. User Levels: LibGuides v1 Librarian and Regular account levels = LibGuides v2 Regular account level. Password: You will use your LibGuides v1 password the first time, then will be asked to reset your password to meet the new password requirements in LibGuides v2. Will guide content from v1 be added as the same content “type” in v2? Yes! If you have a Links & Lists or Simple Web Links box in v1, that will be added as a General box with Link content items in v2. The same is true for books, documents & files, media / widgets, etc. Rich text content will be added as the rich text content type in a General box as well. What will not happen is automatic translation of links within rich text areas into Link content items (a.k.a. Link Assets). You will need to make that change manually after migration is complete if you would rather change those lists of a tags into lists of Link content items / assets. Admin level users will be able to designate which links in their v1 system should be imported into their v2 systems as Database content items. If you have created tabbed boxes or boxes of rotating images using code from our FAQs or other code you created, those will not transfer into the system using the new Tabbed Box or Gallery Box types. That will be a manual change you’ll need to make after migration is complete. Content will be copied in box for box. Any combining of content into one larger box will need to be done manually after migration is complete. Will there be a guide / checklist for migration information? The first one affects everyone: we released some code updates for the Rich Text Editor, including adding in those missing buttons folks have been looking for (including us) – font size, color, etc. If you find you cannot edit rich text areas today, please clear your browser’s cache and try again. That should do the trick! Admins are no longer automatically designated as reviewers. In fact, no one is automatically a reviewer. Now you get to choose who your reviewers are right from the Publishing Workflow setup screen! Just go to Content > Publishing Workflow, enable the function (if it’s not already enabled), then select who you want to designate as reviewers in the box on the right. So, if you find you suddenly can’t publish guides, check your Publishing Workflow settings. If it’s enabled, select some Reviewers and you should be all set! You might’ve also noticed the look of it has changed, too. This site is customer access only – meaning you must be logged in to your LibApps account to access the site. The help icon in the command bar from any v2 site (currently only LibGuides, soon to be LibAnswers, too!) will link you directly to the appropriate area of the site for that product. The Dashboard page of every product has a feed right there for you! So it’s super easy to check on anything new right when you log in. Subscribe using the Email Subscription box in the right hand column and get email notifications whenever we post something new. We’ve been using support.springshare.com as our blog URL for a lot of years now, but it’s time for a change. As of Monday, March 10, 2014 our blog URL will be blog.springshare.com. Our current Help site (http://help.springshare.com) will still be around as well – that’s the site for all of our v1 product documentation. You’ll need to update your blog feed URLs. We’ll still have the blog feed available to you right from the Dashboard page of every product, too! We’ll update this info everywhere on Monday as soon as the change happens! Look for notifications in the updated blog feed on your product Dashboard, the box in the top right corner on your Dashboard, on Twitter (you don’t have to be a Twitter user to check out our tweets! ), as a log in message when you log into your system(s), and any/every other way we can think of to get the message out to you! So, GO! Sign up! Get all sorts of excited with us as we give you a whirlwind tour of the system. Only register for one of the dates. If you register for one and realize that you can’t make it, feel free to register for a separate date and then let us know which date you’d like to cancel. See you there…we can’t wait! It’s been 6 years since LibGuides was first released and oh, my, what a ride it’s been! Almost 4,000 live sites, 55,000+ librarians using it, hundreds of millions of page views every month, and hundreds of new features introduced since 2007. We’re in this for the long haul, and behind the scenes we’ve been working on the next generation of LibGuides – the system that will keep things exciting for the next 6 years and then some. We’re changing the innards of the platform to make it easier to customize, easier to manage, easier to use, and easier to create beautiful content. We have so much new stuff to share with you, it’s hard to know where to begin! This is an opt-in change starting this fall. You decide the right time for your site to move to the new system. You take however long you need to plan and execute the move. In other words, you’ll continue to use your existing LibGuides system, just as you do now, and whenever you decide is the right time for your site to move over to the new platform – this fall or winter, next summer – we’ll make it happen. Your domain, your accounts, your content – everything stays the same in the new system, no worries. More layout options – no more 1-2-3 column restrictions. Easily customizable CSS tabs (no longer image based!). Streamlined admin menu that follows you around whether you’re on your Dashboard or editing a guide. Streamlined guide editing with in-context menus/options. For example, add a new page by simply clicking the + tab to the right of the rest of your pages! 20 different box types making things confusing? Not anymore – we’re down to 3 box types (general, tabbed box, and lightbox). W00t! How often did you want to mix text, links, embedded content, documents, headers, etc. all in one box? Well, with the new LibGuides, you can with the general box type. Limitations be gone! Add sections of links with headings without CSS tomfoolery…it’s infinitely flexible. Wait, wait, wait – a tabbed box?? You got it! Create tabs inside boxes and add whatever content you want – it’s super easy point and click construction. Hold up, now – a lightbox? Like, for content slideshows or carousel-type image rotating goodness? That’s the one! Creating beautiful and dynamic content has never been easier. Did you ever want your boxes to span columns? C’mon, you know you did…we know you did…and with the new LibGuides, you can! You say you want to automatically embed Previous & Next buttons inside your guides? Sure, why not! It’s all right there, in the new LibGuides. I’m sure you’re noticing a theme by now: flexibility. The new LibGuides is flexible – it will adjust to your needs, whatever they are. Centralized asset management (links, documents, embedded content, etc. ): view, manage, edit, reuse…all in one place. Publishing workflows (optional) – guide authors “submit for review”, admins approve the guide for publishing. Fully customizable guide templates – write your own HTML template, inserting special keywords where you want the guide title, description, author info, content boxes, etc. It’s as awesome as it sounds, trust us on this one! Search history (for admins – think QuerySpy in LibAnswers) – see what users are searching in LibGuides (anonymously, of course) and whether they’re finding what they’re looking for. And we have plans to enable sites to tweak the relevance ranking for your site’s search. Stay tuned for more on this later this summer. 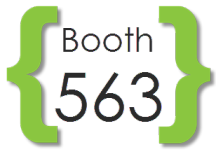 There will be other Flash Presentations on LibAnalytics Insight and LibAnswers Enhancements as well, so make sure you drop by booth 563 to get a presentation schedule! and a whole lot of great information about the Springshare Community, including the article “5 Ways Into the Springy Community”. There are still a few seats available! Thursday’s Springovation program has a few seats left, as does Friday’s Techie Talk track.